I realized this morning that I forgot to post this review of the last of my holiday teas. 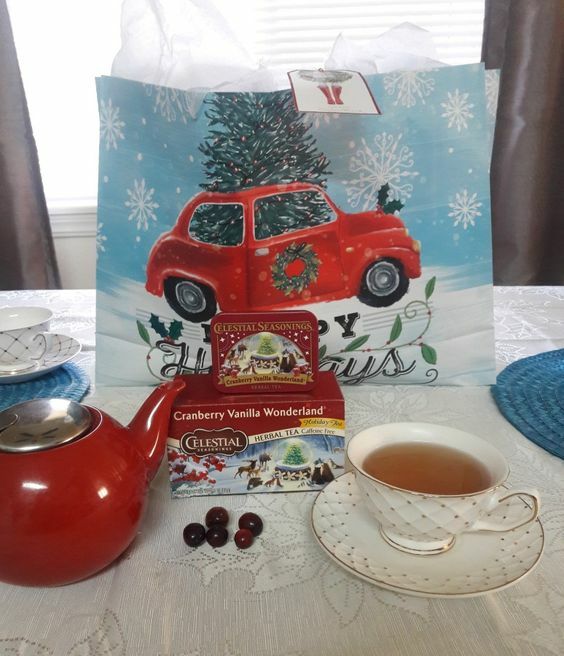 It’s Celestial Seasonings Cranberry Vanilla Wonderland. Caffeine Free! I was so excited by this one. I love cranberries! The aroma was a perfect combination of cranberry and vanilla. I couldn’t wait to taste it. Now for the not so good news. It has Stevia in it. I kept tasting a bitter taste that just reminded me of chemicals, so I looked and sure enough it had this sweetener in it. With Crohn’s I am not able to eat any type of sweetener except honey. So it was a really great idea, but why put the sweetener in? Oh well. So today is a tale I would rather not be telling but I need feedback, I need support and I thank my beautiful friend Cynthia for keeping me sane this past few days! She is the most supportive person I have ever met. She even offered to get in her truck and come up to us. I love her for that. On December 30, the year decided to give us one more F*** You! We have been waiting on the results of tests Tommy (the hubby) had done for the tumors on his leg. We figured the one by his hip was just a fatty tumor, but even with our copy of the DVD of the MRI, we couldn’t tell what the other two were. So ‘Ting’ went his phone and it was a notice that results had been dropped in his patient portal. Hello, Dr. E has sent his findings to your surgeon Dr. C. Findings? Malignant neoplasm of connective and soft tissue of left leg and hip. Boom! And just like that our world started spinning. The Anxiety Fairy brought a few friends even. And of course every doctor was out-of-town until the 3rd. Needless to say the past few days have been horrid. Lots of sobbing, anger and railing at the world about the unfairness of the situation. This morning he called his Cardiologist, Dr. H. Now that man is on the ball. We have an appointment on Friday. By then he will have all the scan and MRI results and one of his colleagues is an Oncologist right next door and he will walk us straight there if necessary. So our stress went down to a 20. It’s always nice to begin a new year with a new project. Mine being a lot of research and also trying to figure out how we got mixed up so badly that now everytime I google anything it pops up on his phone! This can not happen. No one should see my browser history. Ever. So that’s our news. I hope yours is better. Thanks for listening to my garbled mess of a post. And thanks for being a friend. Keeping everything crossed for Friday. Hope it goes as well as it possibly can. Take care, life seems to be throwing so much at you right now! It sure feels that way! Sending warm hugs and positive vibes from the other side of the world. Wow. That was a really bad way to deliver bad news. Sending you hugs and hoping there is some good news coming your way. Prayers are always the best thing to do. I keep reminding myself that so far I’ve done pretty well keeping us alive! There are no good words except to say that my heart is sending you much love during this trying time…thank you for sharing and reaching out…we have your back here on the West Coast! Thank you! We appreciate it all. I still recall the shock we felt with my own cancer diagnosis in 2011…I remember saying “yes” to everything that felt right to me and living my life moment to moment instead of thinking too far ahead. I’m so sorry that you and your family have to face this gut-wrenching challenge…my thoughts as ever are with you all. That suuuuuucks. Not “liking” this post. My sympathies; as the Greeks say, “good strength” to you and yours. An excellent way to say it! I couldn’t ‘like’ this and go on to the next post. Best of luck and good thoughts for you both on Friday. I know what you mean. Thank you! I’m so sorry to hear that you’ve had another curve ball. I continue to pray for y’all. Life can just be effing unfair. I am crossing fingers for you and your other half. I shall say a few words to the higher power as well. I appreciate that so much. We will come through this. I just feel it. Patricia, I’m so sorry to hear your news about the hubby. Sending prayers your way. I share your frustration with sweeteners added to thinks that (I) don’t (think) need it. I react to virtually everything, so I’ve had to toss out some tea and miscellany even with my usual vigilance buying new products. I love you, my sweet friend. I’m still willing to drive up if you need me.